Our last meeting was surely a marvellously sunny oasis in the long months of wintry weather which were February and March. But this weekend heralds Spring and the advancing of the hour so let us hope that we can get out to do what we have planned. First, there’s a message from Head Office which you will also be receiving in a separate email. In addition to the printed quarterly magazine The Arts Society is introducing a monthly e-newsletter curated by its editorial team and delivering exciting new content directly into your email inbox at no extra cost. The newsletter will include even more exclusive interviews, background stories, competitions, special offers and updates on events and exhibitions. Apparently it’s a must-read for lovers of the arts! As you may know, data protection laws are changing so if you want to receive the newsletter please ensure that you opt in to receive it (you can opt out at anytime). The Society will send one further reminder email and then send no further electronic communication, so please sign up now by going onto The (National) Arts Society website or by responding to the email which is being forwarded to you shortly by our own Arts Society. At this month’s meeting, Kate Varney will be selling tickets for the Biennial Dinner on Wednesday 13th June. The price is £50 per ticket for a delicious three-course meal. This event is also going to mark the Golden Jubilee of The Arts Society and our own Silver Anniversary which will be in October this year. Walton Hall, near Wellesbourne, is the impressive venue for the event, set as it is in extensive parkland by the side of a lake and shielded behind by the wooded Friz Hill, on the edge of the Avon Valley. It will be a wonderful venue for such a celebration. The original 16th century house was remodelled by Sir George Gilbert Scott in 1858 at the request of the then owner, Sir Charles Mordaunt, whose infamous divorce proceedings, all-too-publicly citing the Prince of Wales, was related by historian Elizabeth Hamilton, in her book ‘A Warwickshire Scandal’. We are delighted that Lady Hamilton, herself, will be our speaker at the dinner; so do mark Wednesday 13th June in your diaries and remember to bring your cheque books to the April and May Meetings. John Clark (Short Breaks) is very busy at the moment as he taking the tour to Provence at the end of the month. We wish all those who are going a wonderful time and we envy you! He has asked me say that although there is a very comfortable number of people signed up, there are still a few places remaining for the Short Break to Yorkshire: September 21st to 25th 2018. Please contact John on 07973 322159 if you want further information or would like to book. The cost is £560 and is for 4 nights in the Majestic Hotel in Harrogate. The trip will take in Newby Hall, Harewood House, York and the Minster, Fountains Abbey…..and much more, including, of course, Betty’s Tea Rooms! Ann Pitt is running a waiting list for tickets for the Day Visit to Oxford on Wednesday 9th May, so get in touch with her if you want to be added to the list. It’s always worth putting your name down on a waiting list as people’s plans do change and a place might come up. The New Members’ Coffee Morning, which was postponed from last October to Friday March 2nd was a casualty of the Beast from the East and had to be cancelled at the eleventh hour. However, the Committee has arranged yet another date, Friday May 4th and, as before, it will be held at 10.30am at Charlecote Village Hall with access to the church afterwards. Several projects in which our Society has been involved will be on display there, the Church Record completed a couple of years ago and a Church Trail. This event is by invitation and for all those members who have joined since last March. I had the great privilege last week of attending a Poppies Workshop for Young Carers in Warwick (organised by Matt Deakin) which was being funded by our financial support of the Warwick Poppies 2018 Appeal. 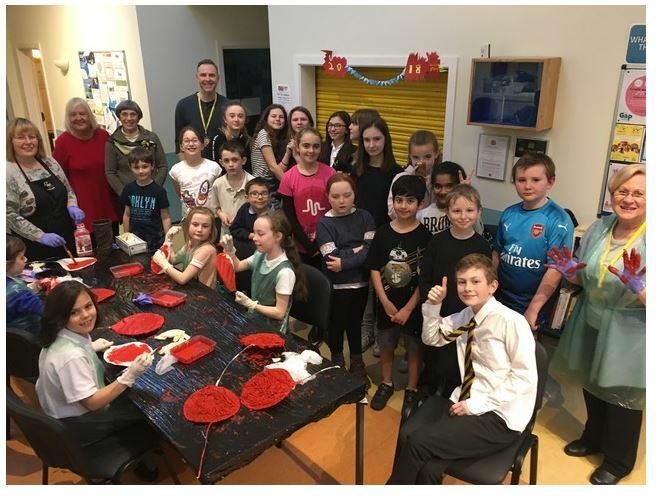 Artist Annette Smyth together with Brenda Watts (one of our members) were helping the young carers make and compile large poppies for the display at St. Mary’s in November this year. It was great fun, wonderfully messy with a great deal of scarlet fabric stiffener and components made from mostly reclaimed or donated materials. I thank Helen Fitzpatrick (another of our members, who is one of the organisers of Warwick Poppies 2018), who had set the visit up as it proved to be a very interesting and worthwhile enterprise, helping the Young Carers as well as the Warwick Poppies Appeal in a community project. Photos of the visit are on the Warwick Poppies 2018 Facebook page. Those of you who have seen the latest quarterly Review will be pleased to note that the Gold Star Award for our Volunteers at the Herbert Art Gallery has been included in the Societies’ News – page 65. Unfortunately, they have edited out both the photograph and the mention of the Herbert Art Gallery or Coventry, which renders the piece less useful, but I have persuaded myself that we should be pleased that our Society has once again achieved recognition in these pages and we congratulate once more our volunteers there. I have been asked to remind you, if you are interested, to apply for the West Midlands Area Day of Special Interest – “Two Wrekin Gems” – at Tong on 19th July 2018. Details are on the West Midlands Area website. Lastly, a little alert: if anyone wishes to raise a Resolution at the AGM on July 4th please give notice in writing to the Secretary of The Arts Society Royal Leamington Spa, Mrs Janet Looney, at least 6 weeks prior to that meeting. Any such resolution must show the name of the proposer and seconder and shall be included in the agenda of the meeting. Contact details for Janet Looney are on the programme card. I forward to seeing you at the April Lecture Meeting on 4th April for our lecture on “The Secret Language of Sacred Spaces: religious architecture of the world” with lecturer Jon Cannon.